Live in Southern California and planning your summer garden? Concerned about how you’ll be able to live with beautiful flowers through scorching temperatures, or with water restrictions that are in place in many areas? There are some great ways to maintain a garden that has a big impact visually, but that keeps weather in mind and doesn’t use up precious resources. The following are some water-wise ideas for gorgeous summer gardens. To make a statement with a summer garden, opt for one filled with succulents. 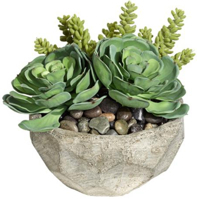 Succulents give structure to a garden, offering flowing or striking geometrical shapes that are like living sculptures. Because rain is rare in Southern California, and water companies penalize for water overuse, it’s wise to choose garden flowers that don’t depend on much moisture to thrive. Succulents are perfect! 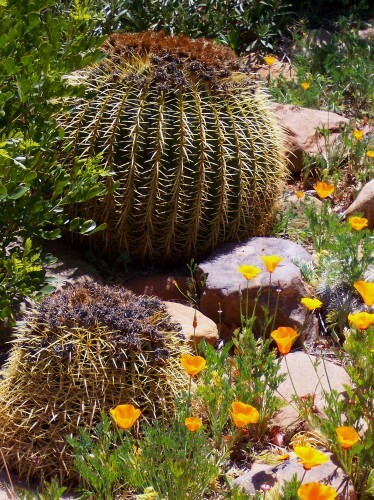 Arrange these drought-tolerant blooms amongst boulders and borders, and group them like pieces of art. Turn to romantic and beautiful wildflowers for So Cal gardens during the summer months. Make a dreamy garden filled with wild blooms that don’t require a lot of water by choosing wildflowers from seed, and then plant them during springtime while the weather’s still moderate. In summer, you’ll have a gorgeous display of colorful blossoms that are naturally drought resistant. Consider wildflowers that are local to your area (go to your local gardener), and think about blooms that will attract friendly bees and butterflies. Summer gardens that include low-water plants, recycling-water features, and shade trees are beneficial to area birds. Hummingbirds especially love the dwarf bottlebrush’s red blooms, so see if you can plant this gorgeous varietal. Consider trees that are large enough, or can become large enough, to provide shade for your home too. Even if you have to plant them young now, you’ll reap benefits in just a few years. Adhering to a garden-planting scheme that works with the cycles of nature, and with any restrictions that your city has in place, is the best thing to do if you want a low maintenance, yet enjoyable, garden. Live in Southern California and planning your summer garden? Concerned about how you’ll be able to live with beautiful flowers through scorching temperatures, or with water restrictions that are in place in many areas?There are some great ways to maintain a garden that has a big impact visually, but that keeps weather in mind and doesn’t use up precious resources. The following are some water-wise ideas for gorgeous summer gardens.